but the UK edition is scarcer, with no copies listed on Amazon at all and only two on AbeBooks (and one of those is sans jacket). Then again, I guess not that many people are hunting for it; I got this one on eBay, where I was the only bidder, even though the price wasn't extortionate. Anyway, according to those who know, it's a cracker in Westlake's canon, and I'm glad to have it. And tomorrow, all being well, I'll have an even scarcer Westlake Score to show you. Can you guess what it is yet? Ooh, interesting guess. But no. Actually I'm being a little misleading... Post coming soon. I just read Brothers Keepers and I thought it was wonderful. It may be my favorite non-series Westlake novel of all. Funny in a gentle sort of way and rather erudite (but in a good way). 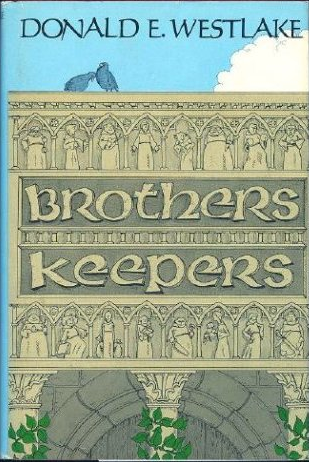 I know you are on a strict all-Elmore reading regimen but if you felt the desire to read something different, Brothers Keepers is a real gem. Have you looked into Peter Leonard yet? Voices of the Dead and Back from the Dead remind me of The Hunted. The strict Elmore Leonard diet is over now – I'm still reading Leonard, but with other things mixed in. I've been thinking I should get back to Westlake – I'm certainly getting back to Ross Thomas, incidentally – and maybe Brothers Keepers will fit the bill.